When they work up the nerve to take a closer look, guess what's inside? 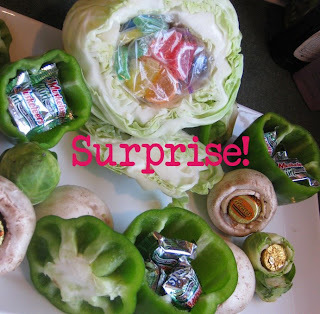 You can check out some other fun April Fools Day ideas here. Have fun! I love baking from scratch, but there are times you really need something quick. I know a lot of us are concerned about the additives and preservatives that our kids eat but we also need quick fixes sometimes. I have an amazing solution that I found last week...Naturally Nora Baking Mixes! All natural ingredients, NO artificial colors/flavors/preservatives, NO hydrogenated oils or trans fats, just lots of love and great ingredients. 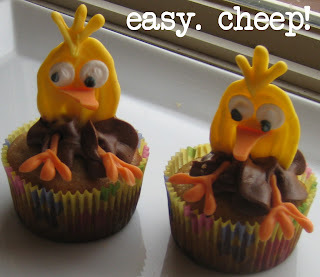 We made these adorable Chick Chick Cupcakes (templates and instructions below) using her Surprising Stars Cake Mix and Cheerful Chocolate Frosting Mix and YUM! They were crazy-delicious! You may not have her mixes available in your area, but I found that you can get them on Amazon. 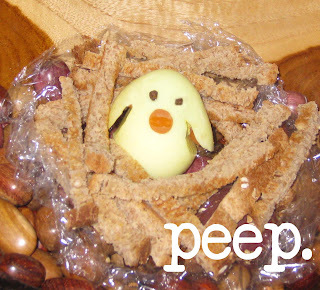 Note: Below is a video tutorial on how to make the chicks, it's easy, I promise!! Print chick template and tape to countertop. Tape wax paper over template. Put orange candy melts in a microwafe safe bowl and microwave on high for 60 seconds. Stir well and microwave at 10 second intervals until completely melted. Put in ziploc bag and snip a small corner off the end of the bag. Draw the triangles (beaks) and feet. Let dry completely. Repeat melting instructions with the yellow candy melts. Draw the oval bodies with a few lines on top for feathers. While they are still wet, place two eyes (I always make a huge batch and just keep them in the pantry, we use them all the time!) and a beak on the body and let dry completely. When set, put a dab of chocolate icing on the cupcake, then gently press two feet into the icing. Take a chick and gently push into the top. Enjoy! Here is a cute "flock" of chicks that I made on cookie bars for Big C's class party. They were a hit! We have a guest blogger! Last week, my darling neighbor Miss M (8 years old) was at your house and told me, "I've seen your blog, you have some good ideas. I really liked Big C's Snake Pizza tutorial. 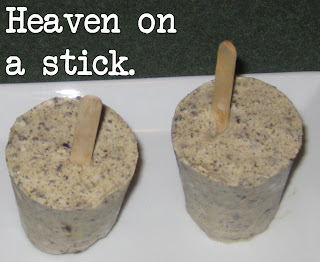 I make these really good oreo pudding popsicles, they are awesome. I could show everyone how to make them." Well, who would turn down such great enthusiasm for cooking and an opportunity to feature something so yummy? So, I present Miss M with her helpers Little C & Big C with a yummy after school snack! Their video tutorial is very helpful and just plain darling. You all are going to be great chefs someday! 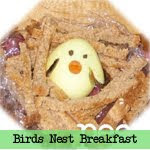 To celebrate the first day of Spring, we're having Birds in a Nest for breakfast. 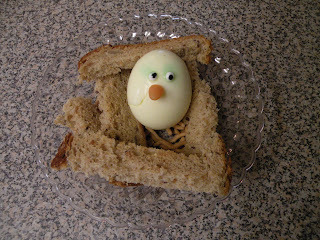 The traditional "Bird in a Nest" is a piece of toast with a hole cut out and an egg fried in the hole. We used the same ingredients, but made it a little more fun. This is also a great idea for using some leftover colored Easter eggs, you'd have some very colorful birds! Peel egg and gently cut a slit up each side for the wings (be sure not to cut all the way through!). Place egg in a bowl of cold water tinted with a few drops of yellow food coloring (optional). Let sit for 2 minutes. While egg is coloring, cut toast into very thin sticks. Arrange on a plate to look like a "nest". Remove egg and dry with a paper towel. Put two cloves on the egg for eyes. Take a baby carrot, cut the end off, then cut out a notch at the end for the "beak". Using half of a toothpick, poke one end in the carrot and the other end in the egg to attach the beak. I also slid a small piece of carrot beneath the "wings" to make them stand up. Enjoy! Note: If you have small children, please make sure to help them remove the cloves and toothpick before eating. You can also use a raw spaghetti noodle instead of a toothpick if you are worried about your child eating it. Bobbi over at Casa Camacho already made them (wow, she's fast! ), look how cute hers turned out! I knew there was NO WAY I could choose the finalists myself (besides, I knew a few of them and wanted to be fair), so Gourmet Dad, myself, and 9 other neighbors reviewed each entry in detail and voted for our top favorites. Take a look at these amazing entries! 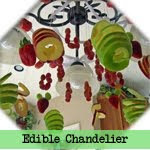 If they have a blog, I linked to it so you can get the recipes and even more fun photos of their creations. Mr. William Jackson, age 4 1/2. The combination of Cinnamon Toast Crunch, Taquitos, Cake, Sprinkles, and banana was genius. Pure genius, I tell you! Fill a with Cinnamon Toast Crunch, then place a banana firmly on the edge of the bowl. 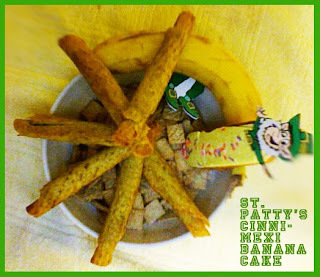 Arrange taquitos in a "wheel-spoke pattern" over taquitos and banana. Place cake in an empty space near the middle of the bowl. Savor. It didn't make the finals, but I loved it so much that I'm sending you a special prize, William! You are going to be an amazing chef someday, keep creating in the kitchen! Congratulations to the finalists! I put a poll up on my sidebar, check them out and you can vote for your favorite until 3/26! The prize box arrived today, I'm so jealous! Here are a few of the fun cupcakes we made today and also some great advice from cookware.com for kids in the kitchen. Take 2 green mini-marshmallows (they come in the multi-colored mini marshmallow bags), snip in half and place on cupcake to form shamrock. Snip a small piece of another marshmallow for the stem. 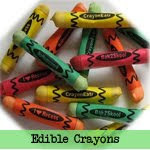 Throughout the day kids are always getting into some new activity whether it is exploring the backyard, playing on the swing set, or drawing colored chalk pictures on the driveway. As parents, we try to look for ways to incorporate our children into everyday activities and spend as much quality time with them as we can. A great way to combine the two is through cooking fun recipes in the kitchen! While we’re cooking meals for our families and organizing dinnerware on the table, there are countless times where our children ask to help out with the process. Even the smallest tasks like cracking an egg or pouring breadcrumbs into a dish makes them feel proud and accomplished! With the upcoming St. Patrick’s Day holiday coming up around the corner, there couldn’t be a better time to get your kids in the kitchen and whip up some tasty green treats! I haven't decided if I'm a total loser or a kitchen Rock Star for having leftover Valentines Day candy. Ha! 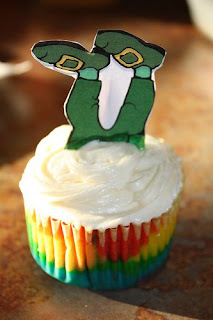 However, it makes GREAT "Kiss Me, I'm Irish" cupcakes! 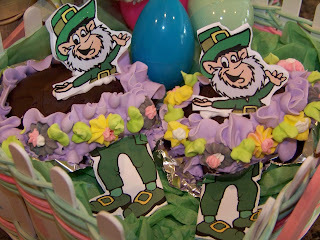 Next year, I'm going to grab a bag of chocolate lips when they go on clearance just for St. Patricks Day! 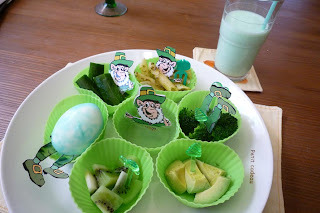 One of the best recipes to start your culinary adventure is with St. Patrick’s Day cupcakes as there are plenty of simple steps that are great for kids to tackle in the kitchen. Teach your kids how to crack and add the eggs to the cake batter, measure the amount of water and vegetable oil that’s necessary for these delicious goodies, and how to put their muscles to the test and stir it all together. Once the cupcakes are baked and cooled, your children can put their imagination to work and design their very own festive desserts. Use green food coloring to garnish your cupcakes with green frosting or add a dash of holiday sprinkles to the mix to finish off with a glittery topping. Introducing your children to the kitchen not only will give them a chance to learn about delicious recipes but they will also understand the importance of cleaning up after themselves and washing their hands. A lesson in cooking and cleanliness can go a long way! 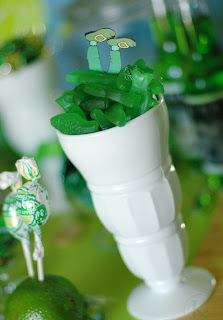 Put melted green Candy Melts in a quart ziploc freezer bag. Snip a small corner off the bag and draw shamrocks on wax paper. When they're dry, you can peel them off and use them for easy decorations! Of course we had to have a Leprechaun stuck in the grass! You can print yours here. 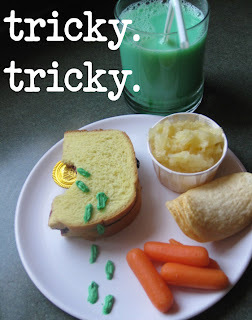 Check out these easy-as-pie Leprechaun decorations I whipped up. 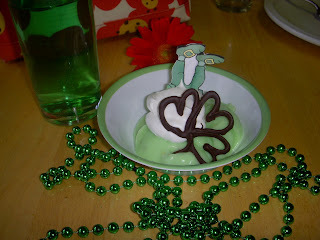 They're an easy way to dress up dinner or dessert for St. Patricks Day! Simply print the template, cut out, glue together with a toothpick, and you're ready to go. (Video tutorial below) How would you use them? Will you tell me? No, seriously, I really want to know! 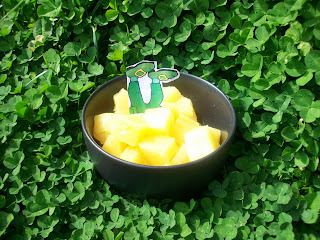 So much, in fact, that we're giving away a $100 worth of goodies from Cookware.com to my favorite idea!! 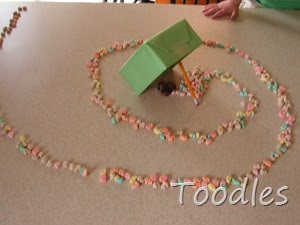 -Follow the instructions to make some Leprechauns of your own. -Take a picture of your creation and either email it to me or blog about it and send me the link. I'll pick my top 3 favorites and we'll let you vote for the winner! 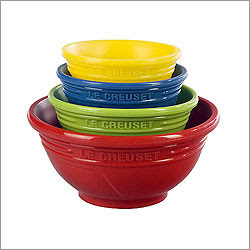 Winner will receive a gift basket from cookware.com with Le Creuset prep bowls (so cool!) and an assortment of Le Creuset utensils ($100 value). If you're not the world's greatest chef, no worries! Two things will catch my eye: a great recipe or fun creativity. 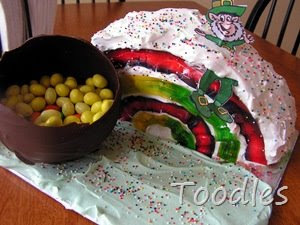 So, find a cool way to sneak those tricky leprechauns into your take-out pizza and you may win! You have until Midnight March 18th to enter and I'll announce the finalists on March 19th. Have fun and I hope to see lots of your ideas! A Huge Thank You to cookware.com for sponsoring our fun event. They have some serious eye-candy and fun kitchen items, I'm actually jealous I can't enter myself! Mix a small amount of food coloring into icing. Put in to baggie and snip a small corner off the bag. Take a small bite or cut out a little piece of the sandwich. 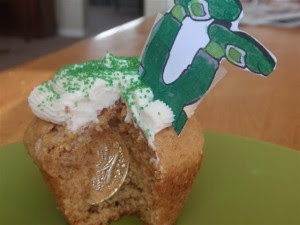 Using the icing, make small ovals starting at the edge of the plate and up onto the sandwich for "leprechaun footprints". Tuck the gold coin into the sandwich (optional). 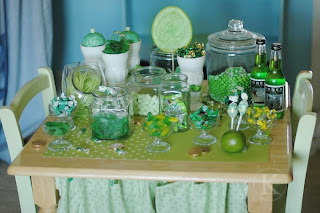 For extra green fun, put a drop of food coloring in your child's milk. Little C: "Wow! How did Leprechaun's mouths get so big?" Big C: "That's funny!! Hmmm...It looks a lot like mommy's bite...."
I wanted to have a little "tasting" adventure with the girls so we decided to make crème fraîche . It's easy and fun to taste the different stages. If you haven't had crème fraîche , it like sour cream but BETTER (less acidic/bitter tasting). Another great thing about creme fraiche is that you can beat it to thicken to the consistency you want. To make authentic crème fraîche, you need unpasturized cream, but I found that you can make a decent version with pasturized cream. The best part? You can keep it in the fridge for a week or so and use it for all kinds of things (potato topping, sauces, fruit dip, etc.). We saved a little to put in lasagna and also made a cinnamon fruit dip. Guess what else? I was featured on RNCentral as one of their Top 100 Healthy Mom Blogs. How cool is that? Thank you! It's a great resource for anyone in nursing. Let the kids taste the cream and tell you what it tastes like. Have them taste the buttermilk. Put both cream and buttermilk in a sealed container. Shake well (make sure everyone gets a turn!). 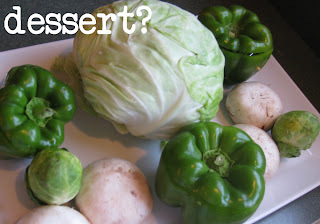 Leave out at room temperature overnight, at least 8 hours. In the morning, shake well. Let the kids taste again--how did the taste change overnight? Add sugar and cinnamon to taste and beat until fluffy. Let them taste again, how did the sugar/cinnamon and beating it change the taste and texture? 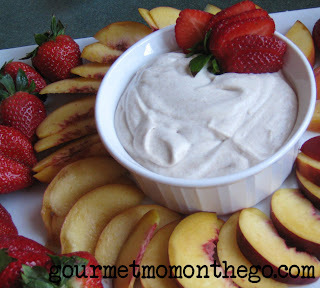 Serve with fresh fruit for a fabulous breakfast! Store leftovers in the refrigerator. 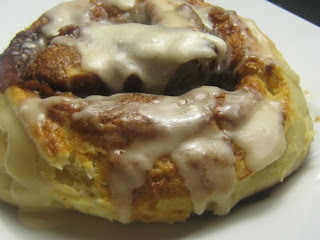 My friend Kari just made the most amazing Yukon Gold Potato Cinnamon Rolls. 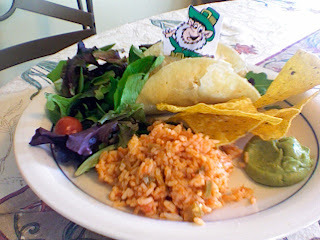 What better treat for St. Patricks Day??! 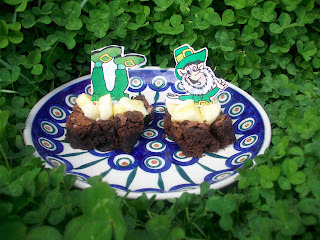 Celebrate the Irish with some potatoes in your dessert! They actually are quite fabulous, it just might be my new favorite cinnamon roll recipe! Combine potatoes, 2 cups water, and 1 tablespoon coarse salt in large saucepan. 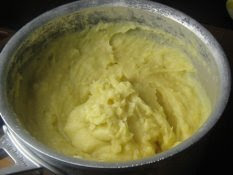 Boil until potatoes are very tender, 15 to 18 minutes. Mash potatoes with water in pan (do not drain water). Add butter and mash until butter is melted. Whisk in eggs, slowly tempering the mixture, then 1 cup flour; whisk until very smooth. Let potatoes stand until barely lukewarm, about 10 minutes. While the potatoes are cooling, pour 1/2 cup warm water into large bowl of stand mixer fitted with paddle attachment; stir in yeast and sugar. Let stand until foamy, about 10 minutes. Add potato mixture to yeast mixture; mix on low speed until well blended, 2 minutes. Mix in 3 cups flour, 1 cup at a time, beating well. Beat until sticky dough forms. Coat large bowl with butter. Transfer dough to bowl and turn to coat. Cover bowl with plastic wrap, then kitchen towel. Let dough rise in warm draft-free area until doubled in volume, about 1 hour. Mix sucanut (brown sugar), cinnamon, and flour in medium bowl. Using fork, mix in butter. Position rack in center of oven and preheat to 425°F. Line large rimmed baking sheet with parchment. This is important so that the rolls do not stick to the pan. Turn dough out onto well-floured work surface. 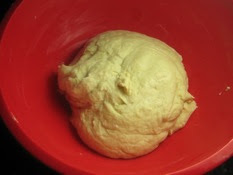 Roll out dough to 24×16-inch rectangle. Sprinkle filling evenly over dough. 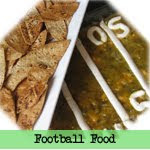 Starting at 1 long side, roll up dough jelly-roll style, tightly, while enclosing filling. Using large knife dipped in flour, cut roll crosswise into 12-14 pieces. Transfer rolls to baking sheet, spacing rolls about 3/4 inch apart. Cover baking sheet loosely with plastic wrap. Let rise in warm draft-free area until almost doubled in volume, about 20 minutes (rolls will be very puffy). Bake cinnamon rolls until golden, about 20 minutes. Cool rolls 10 minutes on baking sheet. 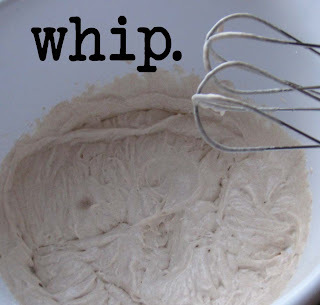 Whisk powdered sugar, melted butter, 2 tablespoons milk, vanilla, and coarse salt in small bowl. If glaze is too thick to spread, add more milk by 1/2 teaspoonfuls as needed. Spread glaze over warm rolls. * You can freeze these rolls and reheat them at 350 degrees until heated through. "I haven't seen these yet. I usually eat boiled eggs for breakfast and then do wii fit. " "love kix!! I make my bed first thing. " "So fun!! To give my morining a great start I need a really good work out. " Kelly—you didn’t leave an email address and your blog is private. So, hopefully you’ll read this and drop me an email or leave a comment letting me know how to reach you. The winners have 3 days to respond then we’ll pick a “runner up”.